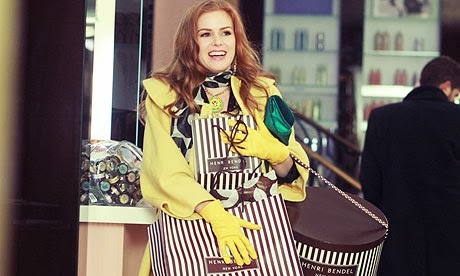 Retail Therapy: Scientific Proof That Shopping Makes You Happy! I know that I have been somewhat neglecting Fashion Mumblr recently – and that’s because I’ve had my final year exams at uni so have been majorly dorking it up in the library *excuses excuses*. But I recently heard some news which I had to share – Shopping has been SCIENTIFICALLY proven to make you happy! Ok, we already knew that, but now it’s Scientific! They don’t call it Retail Therapy for nothing! Not only has purchasing been proven to make you happy, but those who actually bought something, compared to those who just browsed, have been found to be feeling 40 times more in control. Now if there was ever an excuse to add ASOS to your favourites bar (What? It’s not already there?!) then this is it! Visiting a physical store has also been proved to make people three times happier, and has few negative side effects according to researchers at the University of Michigan, however spending cash that you don’t have will of course leave you feeling rubbish, even if you do have a fabulous new handbag to show for it! The study also showed that those who went into a shop in a bad mood were more likely to make an impulse buy, saying that they bought something to cheer themselves up. The study in the Journal of Marketing and Psychology concluded that for retailers to benefit from this trend, they should provide slogans to appeal to customers and encourage them to splurge; think of the Selfridges “I didn’t find it – it found me!’ slogans and the (incredible) Harvey Nichols Christmas ‘Sorry I Spent it on Myself’ advert – those retails are just too clever! That’s the bonus of studying at London College of Fashion, reading articles like that one actually count as research for my dissertation! So hopefully I’ll have some more interesting snippets to share with you soon! I’d love to know what you think about shopping making you happy, is it worth the credit card bills? Let me know!